Dust in the atmosphere and dust settling onto Opportunity's solar panels challenges the ability of the solar panels to convert sunlight into enough electricity to supply the rover's needs. 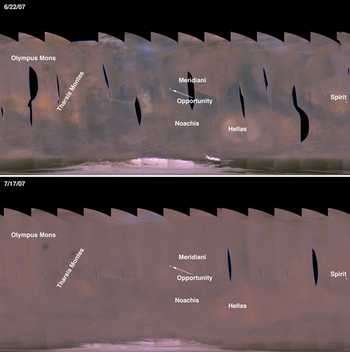 The most recent communication from Opportunity, received Monday, July 30, indicates that sunlight over the rover's Meridiani Planum location remains only slightly less obscured than during the dustiest days Opportunity survived in mid-July. With dust now accumulating on the solar panels, the rover is producing barely as much energy as it is using in a very-low-power regimen it has been following since July 18. "The overnight low temperature of Opportunity's electronics module has been dropping since we implemented the very-low-power operation, even though the outside environment is actually warmer during this dust storm," said John Callas, rover project manager at NASA's Jet Propulsion Laboratory, Pasadena, Calif. That temperature has dropped to minus 35 degrees Fahrenheit (minus 37 Celsius), within about 3 Fahrenheit degrees (about 2 Celsius degrees) of triggering survival heaters to turn on. Those heaters could push the rover's total use of electricity higher than what the solar panels produce, soon depleting the batteries. "This is energy Opportunity does not have to spare," he said.